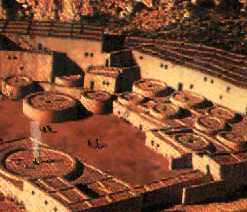 This reconstruction shows Pueblo Bonito, the largest and most elaborate of the Chaco Canyon "apartment-house" towns as it must have looked at the height of the Anasazi turquoise trade power and influence. 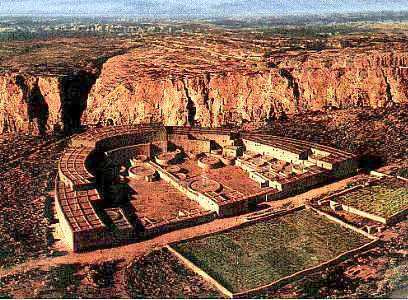 Before it was abandoned, around 1300 AD, about 1,000 people lived in the 600 rooms which are designed to provide stepped platforms from which population and many temporary guests for the religious festivals and trade fairs could view ceremonies held on the outdoor plazas. Closeup shows scale -- tiny figures in the plaza, smoke coming from an opening in one kiva. It is getting toward evening (we are facing north, here), probably most people are at dinner. Anasazi commerce centered on one item: turquoise. Trading groups from the Toltec merchants' capital (Tollan or Tula) in central Mexico visited regularly. Chaco governors tightly controlled the turquoise mines at Cerrillos. Raw stone was brought to Pueblo Bonito to be cut into small tiles, which the merchant-traders took back to Tollan for use in jeweled and tiled creations. 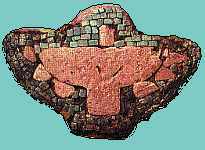 Trade must have diffused from the north, too, because in Chaco and other Anasazi sites are found many small beads and inlays made of carved caitlinite -- pipestone -- from Minnesota and Great Lakes quarries, like the mosaic eagle icon of this page, made of caitlinite and tiled with turquoise. Foreign trade, through the rigidly-controlled Cerillos turquoise mines, was the major source of wealth -- foreign luxury products -- of the Anasazi civilization. Turquoise was also a local medium of exchange -- a kind of money. About 5,000 people lived permanently in the towns of Chaco Canyon in 1100 AD (and tens of thousands visited for big fairs and ceremonies). But in spite of their ingenuity with waterworks, there was arable land near enough to work to feed only 2,000. In the big picture above, we see two intensively-farmed, fertilized fields right outside the town's walls, where organic waste and lots of water could easily be carried to enrich them. Those and other nearby fields weren't enough even for the permanent populations of the towns in Chaco. Some 2500 outlying Anasazi abandoned rural farm villages or single-family pit - and - adobe homes have been found. Turquoise, the medium of exchange, was one thing that pulled their inhabitants into Chaco for the large religious festivals and trade fairs, packing all they could carry of surplus food (such as dried corn, beans, squash rings) on their backs, for there were no burden-bearing animals and no wheeled vehicles. Outlying farmers could exchange surplus food for turquoise, a permanently-storable wealth, which could be traded later, if necessary, for food and craft goods from the center or locally. Turquoise thus functioned for all the people of this civilization as money -- wearable, beautiful, spiritually enhancing, and religiously iconic, but practical, too. At least until the 3-pronged disasters struck. First came Chaco's loss of control of turquoise sources. New mines opened up in Arizona and Nevada see previous previous mines area map). Competitive turquoise trade with their best and only large customer -- the Toltec empire -- began with those uncontrolled mines, but considerable uncontrolled turquoise also entered the Chaco economy, devaluing it as turquoise became more common. More turquoise in circulation was a kind of inflation. Then the foreign market collapsed, as a civil war destroyed the Toltec empire (around 1100 AD). There was no longer a large foreign customer for the turquoise. No more foreign trade. Even more turquoise from the uncontrolled mines flooded the Anasazi economy, further inflation. The final disaster was a 50-year drought, beginning in 1130. Ingenuity in channeling and storing water could not save the worsening situation. Food became very scarce. The outlying villagers had no surplus to bring to the markets in Chaco. They wanted what food they had for themselves anyway. You can't feed your family turquoise, however beautiful, however sacred. And their lands were drying out and dying, too. So the Anasazi began to leave -- not only Chaco Canyon, but other large Anasazi centers established in cliff caves, like those at Mesa Verde (Spruce House is shown here, with others accessible from this site) which once supported thousands of pople in cliff-cave apartment villages. The Anasazi people did not mysteriously vanish. They moved in stages, taking with them most of their valuables, to establish the string of pueblos along the Rio Grande and a few other desert rivers. By 1200 AD, the Chaco Cayon center, and most high desert settlements of the Anasazi civilization were entirely deserted. The turquoise road over the Mexican High Sierra was forgotten, except probably for Mexico-based rumors people there later told the invading Spaniards: about 7 cities of gold somewhere to the north. Some Anasazi created new towns -- much smaller -- as riverside pueblos. Others went to Hopi and Zuni towns in present Arizona and New Mexico, merging with the populations of those nations, whose cultural growth they strongly influenced. Visit the present day Pueblo Cultural Center where there is some info on most of the 19 Pueblos (tribes) of the area. Some Hopi still recall the people who abandoned a once-flourishing civilization by the name of Hisatsinom. But the unrelated Navajo, who moved into the generally deserted area, called them -- with some awe and fear -- the name that stuck: Anasazi, translated roughly as Old Ancestors of the Witchery Way. Though the word "Anasazi" gets the usual bewildering crazy-quilt of translations, the interpretation that these people were evil, had evil powers, is definitely built in to the word. Dineh (Navajo) artist Shonto Begay has -- from his grandfather -- a somewhat different story of the ending of this civilization, one which may be a mythic message for us today. 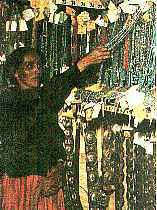 Navajo people in the 20th century developed an adapted form of using turquoise as a method of storing wealth. This woman was photographed sometime in the 1960's insidew the vault of a non-Indian traders' post. She's examining tickets to redeem some of her turquoise jewelry in pawn. Navajos had no access to banking facilities; established and trusted traders served this function. Spare money or trade goods was used to purchase (or trade for) turquoise -- which could be worn at sings and other important social occasions. It could also be pawned when cash was needed. If interest was kept up, the pawn remained in the vault. Some owners pawned jewelry for very small amounts just to have a safe place -- the trader's vault -- to keep the valuable items, where they could be removed for short wearing periods. The trader could only sell "dead pawn" loans gone too long without any payment. Most of the finest pawned work was "live", regularly redeemed. Turquoise was used as a permanent, storable (and occasionally wearable) medium of worth, not pawned out of financial desperation. The people did not follow the practice of accumulating wealth as jewelry, pawning it for cash and safekeeping, except with traders -- sometimes families who had been there for generations -- who were well known as trustworthy. CREDITS: The computer reconstruction of Pueblo Bonito is by CGI Pathway Productions for 500 Nations by Alvin M. Josephy, Knopf, 1994. The mosaic eagle is from the NMAI collection, photographed for The Native Americans. Turner Publishing, 1993 by Jeffrey Jay Foxx.. The woman redeeming her pawn is from Tom Bahti's Southwestern Indian Arts and Crafts. I drew the turquoise border.